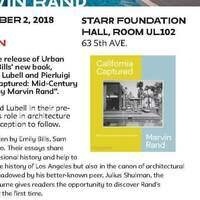 Join us to celebrate the release of Urban Studies faculty Emily Bills' new book, co-authored with Sam Lubell and Pierluigi Serraino, "California Captured: Mid-Century Modern Architecture by Marvin Rand". We'll hear from Bills and Lubell in their presentation on the book's role in architecture with time for Q & A. Reception to follow. California Captured is written by Emily Bills, Sam Lubell, and Pierluigi Serraino. Their essays share Rand’s personal and professional history and help to cement Rand’s legacy in the history of Los Angeles but also in the canon of architectural photography. Often overshadowed by his better-known peer, Julius Shulman, the release of this stunning volume gives readers the opportunity to discover Rand’s distinctive photographs for the first time.